Need to find a pet friendly hotel in Los Angeles CA? Click the Pet Friendly Accommodations Button below! 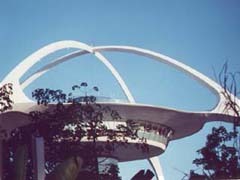 If you fly into the City Of Angeles perhaps the first site you will see is the airports rotating restaurant. You and your pet will be more than welcome in Los Angeles a place made famous by movie stars and their pets. Life here seems to lie somewhere between reality and dream world. This alluring place is where trends are born. Convertibles. Health food. In-line skates, even the Internet. Since it's beginning, Los Angeles has lived on the cusp of a trend, always re-inventing itself - from Mexican outpost to agricultural Mecca to boomtown movie colony. Take your pet with you to dozens of chic cafes with sidewalk dining along Sunset and Hollywood Boulevards. Visit the fanciest shops along Robertson and your pet will be welcome. Accommodations where your pet will be welcome range from turn of the century bed & breakfasts to elegant hotels where your pet will find its own room service menu. Before taking your pet to Los Angeles be sure to check the rules and for the documents you will need. We have pet information for all the world's airlines, plus information on travel by ship, train, bus and car. Find nearly 26,000 pet friendly hotels and accommodations in 5,000 cities around the world where your pet is welcome. It's easy to find dog or cat pet friendly hotels in Los Angeles with PetTravel.com. Click the SEARCH PET FRIENDLY ACCOMMODATIONS button above for a list of pet friendly hotels, motels, bed and breakfasts, small inns, and vacation rentals in Los Angeles. You can even book your reservations on the same page!